Cornwall, Ont. 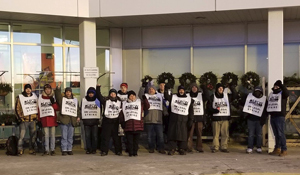 – November 24, 2018 – UFCW Local 1006A food retail members at the Baxtrom’s Your Independent Grocer, or YIG, in Cornwall, Ontario were forced on strike on November 23. The bargaining talks broke off as the company refused to move off a final offer which would lock workers into a long contract without a living wage increase, leaving members with more than 25 years of service 60 cents above minimum wage. Baxtrom’s Your Independent Grocer is a franchise of Loblaw Companies Ltd – the number one grocery retailer in Canada. UFCW 1006A is calling on the company to negotiate a fair contract with a living wage increase that acknowledges the valuable role members play in making Loblaw the multi-billion-dollar success that it is today. The striking unit includes approximately 150 UFCW members who are standing strong and holding the line. To send your message of solidarity and support, go to the 1006A Facebook page. For the latest updates on this important fight for fairness, check out ufcw1000a.ca.